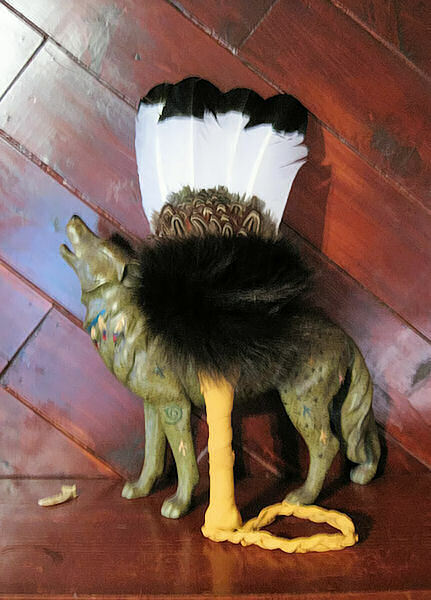 This fan is made from simulated eagle feathers, with pheasant feather accents. The handle is buckskin and wrapped with black fox fur, and has glass crow bead accents. Use the dropdown menu below to choose your leather color. The fan shown is representative. Because this is a hand made item, each one will vary slightly. Because we may make handmade items when you order them, please allow about a week for construction time. This item can be combined with other items in this category that are the same price to meet quantity discounts. Our catalg will automatically recomputed prices when the next discount level is reached.